Agribusiness giant Monsanto - best known for their genetically modified soybeans and "probably carcinogenic" herbicide - has supplied the US government with white phosphorous used in incendiary weapons for at least 20 years, and some of that made its way to Israel for use in Operation Cast Lead. The blog Current Events Inquiry dug into some heavily redacted documents posted in 2012 on the US Federal Business Opportunities (FBO) website, to discover that Monsanto was the purveyor of white phosphorous to the US, and subsequently Israel, including during Operation Cast Lead, which resulted in heavy casualties among Palestinians in Gaza in 2008 and 2009. The "Justification & Approval" document describes the solicitation of 180,000 pounds of white phosphorous (WP), and gives insight into the history of US procurement of the chemical. "The Government is aware of only one source, Monsanto, who currently manufactures WP in the US," the document states, explaining that a company that produces such a chemical should be granted special protections under emergency conditions. "WP requires specialized technology, skills and processes in its production. These technologies and skills must be protected within the NTIB [National Technology and Industrial Base] in the event of a national emergency." Monsanto was not always the sole producer of white phosphorous, but the other manufacturers' names are redacted in the discussion of the history of the chemical. The document indicates that the US was wary of major producers in China and India due to concerns over safety, quality control and environmental standards. "Over the past 20 years, the majority of the manufacturing of WP moved to China and India because of lower costs and the lack of EPA regulations in those countries. In the 1990s, there were [REDACTED] manufacturers capable of manufacturing WP in the United States; [REDACTED] Because of EPA regulations and foreign price competition, [REDACTED] closed their operations. With only one known producer of WP in the NTIB (Monsanto), the Government’s support of this domestic capability is critically important as it reduces the risk to the war fighter in times of national emergency as well as avoiding a potentially dangerous dependency upon a foreign source." According to the FBO website, the procurement was awarded to ICL Performance Products, which had previously won similar contracts in 2008, 2010, and 2011, as noted in the Justification and Approval documents. ICL is a subsidiary of Israel Chemicals Ltd., which describes itself as "a global manufacturer of products based on unique minerals, fulfill[ing] humanity’s essential needs, primarily in three markets: agriculture, food and engineered materials." Quick Burning, WP's Effects Last a Lifetime. Or More. White phosphorus does not just maim, but can kill. It ignites upon contact with skin and burns either until it runs out of fuel or is cut off from oxygen. If inhaled or swallowed it can cause severe damage to any mucous membranes with which it comes in contact. Absorption through the skin means that a 10% burn can cause damage to internal organs such as the heart, liver, or kidneys, and can be fatal. Even after healing from an initial exposure, victims can suffer from long-lasting health problems, including birth defects and neurological damage. A Palestinian man is treated for burns in Jan. 2009. Human Rights Watch reported in March 2009 that Israel had used white phosphorous in the densely populated Gaza strip, in violation of international law. The United States confirmed its own troops used white phosphorous during the Iraq war, in particular during the Battle of Fallujah in 2004. Israel also used white phosphorous in Lebanon while battling Hezbollah in 2006. The US touts its plant in Pine Bluffs, Arkansas as the only plant in the northern hemisphere that fills white phosphorous munitions. And in 2009, State Department officials confirmed that WP munitions from Pine Bluffs had been provided to Israel for use during Operation Cast Lead (2008-2009). Israel initially denied using the chemical during the conflict. But in July 2009, following various media reports and reports from groups like Human Rights Watch and Amnesty International, the Israeli Ministry of Defense admitted using the chemical, but only for its approved use — as an obscurant and illuminant. "The use of white phosphorus is not in and of itself a war crime, and is generally considered acceptable as a means of obscuring troop movements or illuminating areas,” wrote Jason Ditz of AntiWar.com. "Its use in civilian areas however, even if not directed at the civilian population, is banned under the Geneva Convention on Certain Conventional Weapons." White phosphorous is not classified as a chemical weapon and is not completely banned under international law. The chemical can be used in open, unpopulated areas as a smokescreen to hide troop movements or to provide illumination at night. But the Gaza strip is one of the most densely populated areas in the world. 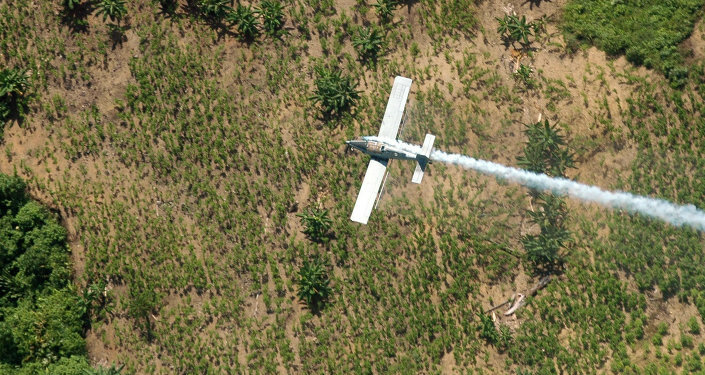 It may seem bizarre that a company known for GMO seeds is producing chemical weapons, but white phosphorous is also used to produce phosphoric acid, a key ingredient in many fertilizers. And lest anyone forget, Monsanto was one of the producers of the 20 million gallons of Agent Orange — ostensibly, a defoliant — used in Vietnam. That country claims that Agent Orange led to to over 400,000 deaths and continues to cause health problems and defects in a third generation of babies. Is Israel Trying to Disrupt Iran Deal by Waging War Against Hezbollah?